Jim & Rita Powell. Joe & Shelia Murphy, John & Vera Neary and Michael O'Malley. The story of the first Irish pipe band in London is inextricably linked to the long established Catholic community in the Borough, an area just south of London Bridge. Historically, South of the Thames was outside the walls of the City of London and as late as 1889 was outside the legal administrative entity that was London. It was where the poorest lived and where Charles Dickens based many of his books. During “Penal Times”, priests secretly served the large Irish community in the Borough - one of the last priest to be sentenced to life imprisonment for saying Mass was a Father Maloney, who was arrested in the Borough in 1765. However the Catholic Relief Act of 1778 gave limited freedoms for Catholics in England to practice their religion and by 1787 the Borough had its own Mission in Bandy Leg Walk. With the advent of the industrial revolution and the associated railways (several of which were to cross the Borough), the population of the Borough was doubling every twenty years and the original Mission couldn't cope with its ever growing congregation. It firstly established, less than a mile away, St George's Chapel in 1829 which when rebuilt in 1848 was to become the first post Emancipation cathedral in England. Then in 1892, less than 100 yards from Bandy Leg Walk, the Borough Church of the Most Precious Blood was opened. From the outset, the Borough parish had a battalion of the League of the Cross (the temperance movement founded by Cardinal Manning in 1872) and an associated drum & fyfe band, playing Irish tunes, to lead its parades. In 1893 The Gaelic League was established to encourage Irish culture and soon thereafter the Borough Band decided to recreate the Irish warpipe tradition. But who was to teach them the technicalities of piping? The 1914-18 War did not affect the Band's viability, as many of its members were too old to enlist. 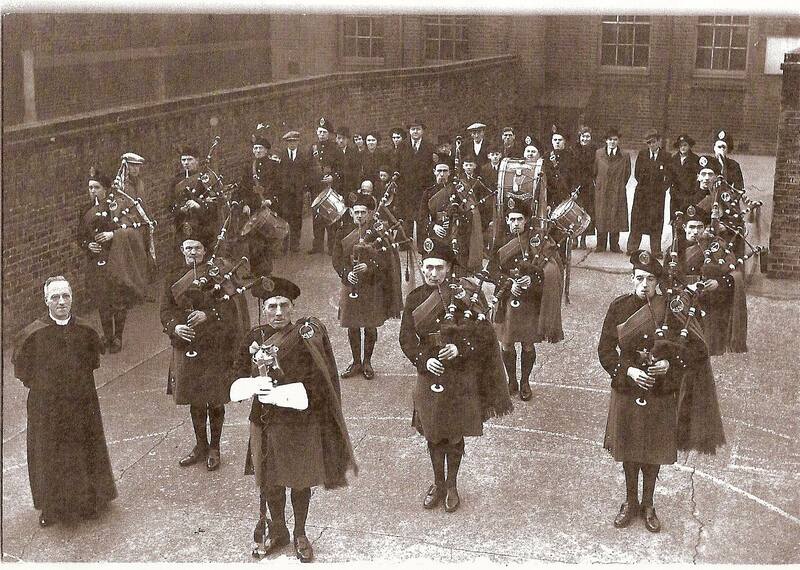 However those members who did serve and survived were unlikely to be teetotal on their return and when the post war parish priest sought to reintroduce the temperance pledge, a number left and formed the Tottenham Irish Pipe Band with a full Gaelic uniform. In contrast the Borough Band's uniform, for the first 45 years of it's existence, was simply a dark peaked forage army cap with a gilt band & braiding and a League of the Cross cap badge. However by 1937 the band had achieved such national prominence (having won the Gaelic League's pipe band competition in two successive years), it was invited to perform at the prestigious St Patrick's Day Ball at the Royal Albert Hall. The Band felt pressurised into adopting full Irish pipe band regalia - green caubeen, jacket & socks and saffron kilt & shawl. This caused some members to leave because they didn't want to wear a full uniform for fear of appearing to be members of too militaristic an organisation. These fears were justified as several band members soon had their lodgings searched for weapons by police investigating IRA activity in London. The Borough, like all areas near the Thames, was heavily blitzed by the Luftwaffe during 1939-45 and uniforms not lost in bombed out buildings, were cut up for use as blankets in air raid shelters. The Band was revitalised after the War with army surplus pipes and suitably dyed khaki uniforms augmenting what had survived. Once again the Borough Band was viewed as the premier Irish pipe band in London and in 1958 it even established a junior band which was to perform throughout Europe. From 1970 onwards the Irish piping scene in London as affected by the situation in the North of Ireland and many bands fell dormant. However, the Borough Band was revived in the late 1980's and performed at various events to mark the Parish's Centenary in 1992. THe band in 1935-no uniforms except the cap. 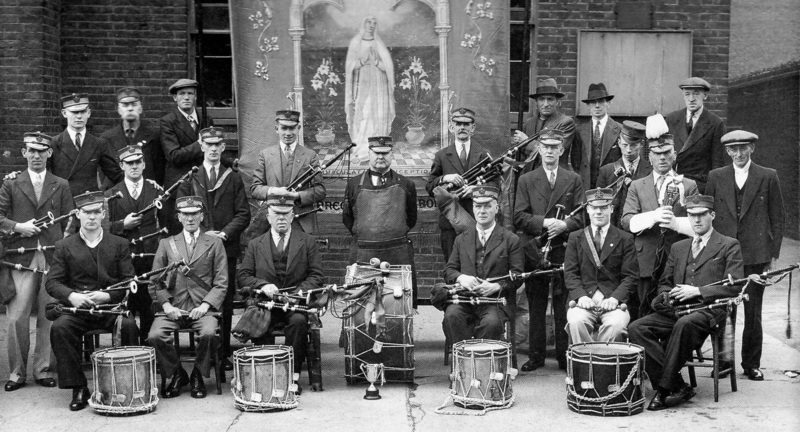 THe Band in 1937 with Irish uniform including caubeens with the League of the Cross cap badge. At this time only one two droned is seen in the photo being the right front piper. Notice the shoes are minus the typicle Irish buckle and use the tongue flap in the style of the Irish Guards Pipers. I thank George P Willis for sending this article and photos.